Shock-jock Barry Champlain, the lead character in Eric Bogosian's compelling, disturbing, and funny play Talk Radio, loves nothing more than to antagonize his listeners. Diving into the bizarre fringes of popular culture, Champlain picks at his callers' fears and angers. Even as he insults and berates them, however, his callers remain hooked by the relentless abuse, which delivers high ratings for the controversial nightly show. 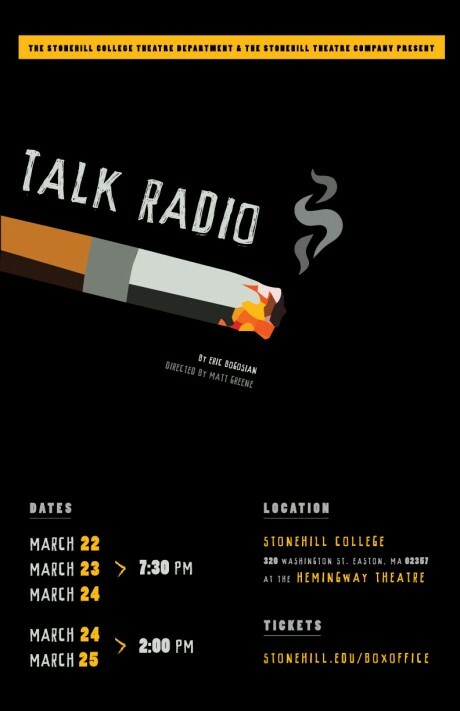 We recently spoke to the Stonehill Theatre Company's (STC) artistic director Matt Greene to find out why Talk Radio, which won two Tony Award nominations and was adapted by Oliver Stone as a movie, was chosen as STC's spring production with performances in Hemingway Theatre later this month. Q: What attracted you to doing Talk Radio now? Greene: Talk Radio has been on my radar since it was written 30 years ago, but never has it been as relevant as it is today. We ALL are the callers now. We ALL are Barry Champlain. Social Media has made it so. We are living inside a talk show, where pushing agendas and trying to prove others wrong, hateful, and deserving of scorn and punishment is the soup du jour. What is our endgame? If we keep ignoring history and facts in order to feel good and righteous in the present, where will we end up? Q: A reviewer once described the call-in show at the center of play, "as a metaphor for America's lost souls" What do you think he or she was getting at? Greene: I believe the reviewer was spot on. When we feel alone or frightened or angry, and we can’t understand why or how to fix it, our modus operandi is to blame others—like the callers in the show. It’s so much easier than the alternative. And when the facts don’t serve our feelings, then we assault them as well. The difference between now and when this review was written (for the 2007 Broadway production), is that the internet has now become a vortex that has pulled us all into the vitriolic world of the call-in radio show. Where once discussion was limited to a handful during the course of an evening, just try posting something, anything, on social media now and see how long it takes to hear from a contrarian wagging their finger. Q: This is your second play since arriving at the College last summer what has it been like working with our theatre students, especially on a play like Talk Radio? Greene: Yes, it is the second show as Artistic Director, but my first show directing here. Last semester we presented Almost, Maine, which is as safe and sweet a show that exists. That’s not to say it was fluff—it is not. But coming to a new community I wasn’t sure if it was ready, or willing, to engage in the kind of show that Talk Radio is. From my brief time here, speaking with students, staff, faculty…I’ve learned that it’s, perhaps, overdue. The students in this show are amazing. The dedication and commitment they have to the project is just incredible. There is no requirement stating that a student must be in a show. This is an 18-24 hour/week voluntary commitment. It’s not a club. It’s a lifestyle. And to count majors from Neuroscience, Psychology, Communications, Biology (to name a few) among our ranks, makes the experience that much richer. Q: Are there any particular challenges that the play presents for young/aspiring actors? Greene: Sure. It’s heavy. It’s also very funny. And when those lines get blurred it’s dangerous. It shouldn’t be, but it is. From a logistical standpoint, the play is unlike any other. Some actors never even step foot on stage! Just six actors handle the 25 unique callers over the 90-minute play. Some must switch characters within seconds of finishing the last one. To be clear, these are not just “voices” that the actors are making, but fully realized characters with hopes, dreams and problems. I required all the Callers to create full biographies for each of their characters which include Pinterest boards showing their styles, dress, home life…I even asked them to give each character a theme song. On-stage characters have the challenge of living in real-time (the play unfolds in real time), while saying very little for long stretches. In fact, the character with the most stage time, Spike, has the fewest lines in the show. That makes his job harder, not easier. Q: For this production, you are casting a professional actor in the role of Barry Champlain....what prompted you to take such a step? Greene: This approach comes from my training at UConn, where every show was Equity—meaning we had union actors in them. The lessons I learned from those professionals couldn’t be taught in a class. To expose young actors to professional actors in a setting where they are wholly dependent on each other, is the quickest way to elevate their “game” and to groove patterns of professionalism. 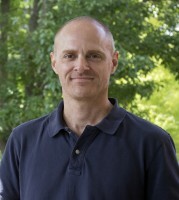 Nick Wakely, who directed Almost, Maine in the fall, was an easy choice to cast as Barry. He already had a good relationship with the students, and I knew they would be comfortable taking this journey with him. It is also rare to find a play in which every character engages directly with the main character. March 22, 23, & 24 at 7:30 p.m.
March 24 & 25 at 2:00 p.m.